I specialize in building custom WordPress sites and I was always looking for a good eCommerce alternative for my clients. It is known that eCommerce plugins for WordPress are buggy and the few premium versions available are limited in terms of functionality and flexibility. I wanted a self-hosted solution because it’s not always profitable for clients to pay commissions to the cloud hosted solutions such as Shopify, Volusion, and BigCommerce. Moreover, you have access to the database, which is important if you need full access and rights to your store. I researched a few options for self-hosted shopping carts. Magento is a free eCommerce solution, probably the most popular for complex sites but it’s also renowned for the steep learning curve, hard to maintain, and overkill for most clients. Digishop is the self hosted version of CoreCommerce. It’s robust, but the price ($800-$1000) is too high compared to other alternatives. Also, I don’t think it’s straight forward to update. This cart was actually my first option and I would have considered it over Lemonstand since it has many functions. However, upgrading the cart overrides your custom theme (there is a method to build the theme so you can avoid that but it’s not straight forward). The support is located in Russia so you usually have to wait 12 to 24 hours for support, which is inconvenient. The price is an affordable $300. I wanted something new, affordable, easy to maintain, upgrade, and develop, and easy for clients to manage the content. Lemonstand is a modern solution, started in 2010. It is complex but flexible and easy to develop with. Here is a link to their demo site. Someone finally made a self hosted solution super easy to update without any work on the developer’s part. Click upgrade and you’re done! Your website files are untouched and your cart is up to date with the latest features and fixes. Easy and cheap to maintain. I’ve never been a fan of taking an existing theme and customizing it to make it look like the original design. The site gets too cluttered with a lot of unnecessary code and it’s DIFFICULT to make it pixel perfect. That’s why I believe that creating everything from scratch is the way to go. I can now start by coding the static site like I always do, then just copy and paste the HTML/CSS/jQuery in the Lemonstand back-end. 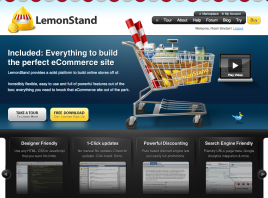 If you can build WordPress sites, you definitely can built eCommerce sites using Lemonstand. You not only have 100% full access to the HTML / CSS but you can also alter the way the site works. You can build a custom check-out process, change how the pages interact with one another, and you’re not locked in a certain way to make things work. Everything is straight forward to understand: the implementation consists of Pages, Templates, and Partials. Pages represent the content base. You can use Templates when you want different layouts for some Pages. Partials are code blocks that you can pull into your Pages or Templates (e.g. when you create a partial named Header with your header info). If it doesn’t support certain functionality, then you can go ahead and develop a custom module for it or you can easily find other developers to do so. The back-end was another reason why I love the system. All main functions are organized in a drop-down and as you select each one, the secondary options load in a top menu. It’s easy to find your way around and this is one of the main reasons why clients have no trouble managing the content. You can also edit the CSS and the PHP code in the back-end by default, so you don’t have to work locally then upload the files, but there is an option to do so if you want to. I figured out it’s easier to use the provided page editor, which includes syntax highlighting. You can even save a page from keyboard (CTRL+S / CMD+S). The staff is very helpful and responsive and that is super important for somebody new to the system. Their documentation is helpful, but it’s still nice to see somebody covers your back. The forums are good for starting out, but for existing clients they have a ticketing system in place where you get faster responses and help with more advanced questions. Lemonstand is still in its early stages and may lack certain features, but it’s being improved continuously and it’s evolving fast. Lemonstand has almost all the bells and whistles, but not quite all of them. The modules are being developed and more functionality is added to the core regularly. The only drawback I found in the checkout functionality is that Lemonstand requires an order to be placed before somebody can pay for it. If customers get to the Payment page and they change their mind without completing the payment, the order is placed in the back-end. Luckily, the orders are being marked in back-end as paid/unpaid so you won’t ship unpaid orders. By default, when you get to the Payment page the cart empties, so if the customers wants to go and add another product they will lose all cart contents. Thankfully, there is a workaround for keeping the cart contents, but using that, it will show up in the back-end as multiple unpaid orders for each time this happens. This is not a deal breaker but it could lead to inaccurate reporting. Currently, Lemonstand does not allow clients to easily customize their site navigation links. WordPress custom menus would be awesome here. Despite the few drawbacks Lemonstand has, its strengths outweigh the weaknesses. It’s an affordable solution that also saves me development time when building eCommerce sites for my clients. I don’t know when this article was written but I think the bug you mention in the article is already fixed. I am researching for shopping cart which can be easily customize, extend and update. Lemonstand looks pretty good and I would say it is the only one that catching up with current technology. However for features wise, I would choose CS Cart. And about Interspire/Bigcommerce, I only hear bad support about and their update process are so 90’s.. It’s deal breaker! Thanks for stopping by. The place order logic glitch is there to stay, but after working with it is really not a big issue at all. They also get new modules and is not hard to write your own. Lemonstand is really one of the best on the market. Thanks for confirming my conclusion, I have tested countless solutions only to be disappointed that there is very little control over design (some for reason). I’m having trouble getting my head around the concept of pulling cart functionality into my site. I assume that’s not actually correct, rather you add your site content (design) to their software, correct? If so, I guess this means developing your pages locally, then copy/paste them into the backend, correct? If so, where do you drop this code and how do you actually make them come alive? How would I get a category, product, or the cart to appear between the body tags? Is this a fairly straight forward task, or is it full-blown development based on reading countless docs? @Joseph I encourage you go and play with their demo back-end and you can see how everything is put together. It’s straight forward to understand and work with. My favorite way to do it is to work in browser but you have an option to tweak the files and ftp them. I have the developer version installed, and believe me, if I could figure out how to achieve this, I wouldn’t have asked for help. I can’t seem to find anyone that knows (or is willing to share) the concept of display a product on your own HTML page. First of all create your static HTML/CSS then include it in a LS layout. When you create your product page, choose that layout template. Ideally you create two partials with the header and footer code that you pull separately in the layout.